Bruce on Bruce | Better days! ← The best kind of maths! I am reading this book of interviews slowly, savouring every moment. 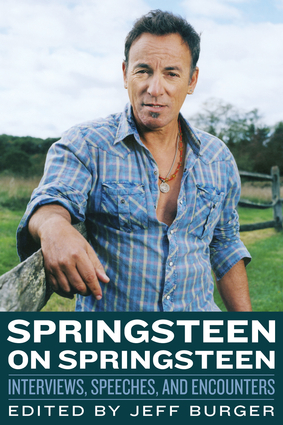 Through his own words, Bruce comes forward as the human being we know him to be. Just a kid from an insignificant town doing what he does best. And trying to be useful while enjoying himself. … overlooked aspect of Bruce’s many talents is his ability to express his hopes, dreams and dedication so eloquently in interviews and speeches. … he is often as articulate and provocative in interviews and speeches as he is emotive onstage and in records. Springsteen has little small talk. … signs of having had some considerable thought expended on them. … he was running on fumes and instinct, the way the best rock and roll always does. This entry was tagged Bruce Springsteen, celebrities, E Street Band, fame, music, rock, rock music, Springsteen, The Boss. Bookmark the permalink. Great to see you here, Jeff! Will have a look – very interested in Cohen, too.